Hazard Perception - help, hazard perception visual explanation, hazard perception dvds. On the test the video clips (which are screen size e.g. 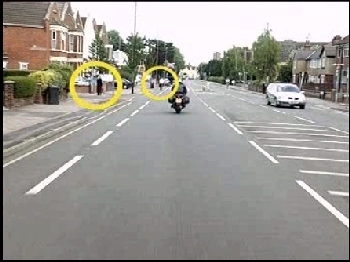 bigger than the examples below) are from the driver's point of view - imagine you are the driver. Look as far down the road as possible - look out for developing hazards. 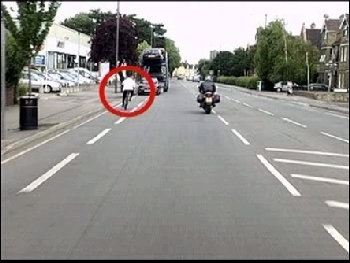 There's a pedestrian at the edge of the road and there's a cyclist ahead. Both are potential hazards - but don't click the mouse button yet! Keep an eye on them - remember we're looking for developing hazards. You've passed the pedestrian - nothing developed. 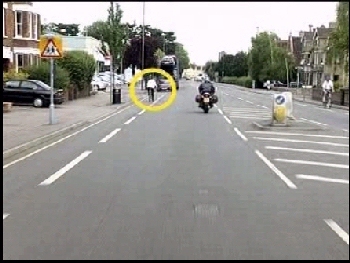 However, the cyclist is still in front. 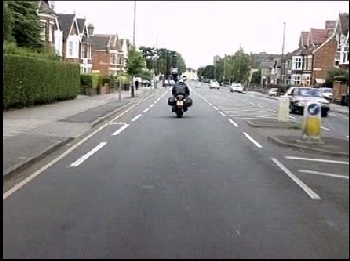 Keep watching - are they going to effect your speed or direction? On your test you would CLICK NOW! Because you spotted this situation early you potentially scored 5 points. 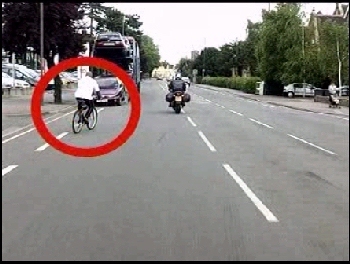 On your test, if you missed the cyclist at first you must click now! You will score less points for spotting the developing hazard late. If you leave it too late - you will score 0 points!